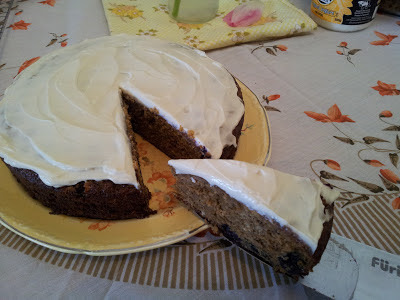 Butter and Buntings: Banana and Blueberry cake with cream cheese icing. Banana and Blueberry cake with cream cheese icing. Each week, hubby and I like to have something baked in the house, ready to eat for afternoon tea or take to work. The past week, it's been a very delicious Banana and Blueberry cake. I followed the recipe for my chocolate banana cake, but left out the cocoa and added 3/4 cup of blueberries. I also iced it using my homemade cream cheese, and it was oh so delicious! Throw everything in a large mixing bowl. Mix well. Pour into a greased cake tin, or patty pans, and bake for 30-35 min at 180C or until a skewer comes out clean. Cool on a wire rack before icing. Mix the icing ingredients in a bowl until smooth and creamy and the flavour is to your liking. Spread onto your cooled cake. Cut a generous slice for yourself and enjoy!